But here is the thing: they do last. The egg on the left came from a batch that I sealed with polyurethane spray, while the one on the right was sealed with two coats of Mod Podge on the outside and on the inside. That is the important part — the inside. Egg shells are very porous and they become more and more brittle as they dry out. If you seal the shell from the outside AND the inside, the Mod Podge will soak into the shell and create a web-like bond, strengthening the surface. The end result is almost like plastic. Delicate, but strong. Those eggs will last for years. The egg on the above right has survived eleven years and four house moves, and I can still drop it on the coffee table from 10″ up without a crack. Not that I suggest you try dropping your eggs, but you get the point — who knows how long it will last?! I know what you are saying… OK fine, I get it, but how do I seal the egg shell from the inside? First create a sealant coat out of equal parts Mod Podge and water. You can brush it on the outside easy enough, but getting it on the inside takes some finesse. If you have access to an eye dropper, go for it, but if you have straws around that will work too –just insert one end of the straw in the liquid and hold your finger over the opening on the opposite end of the straw, creating a temporary vacuum that will allow you to carry the liquid to the egg. Then lift your finger off the straw to drop the liquid inside the egg through the top hole (this is very scientific). Put your fingers over both egg holes and shake away! Let the excess liquid fall out as it dries. As long as the shell is dry from the start, it will absorb plenty. 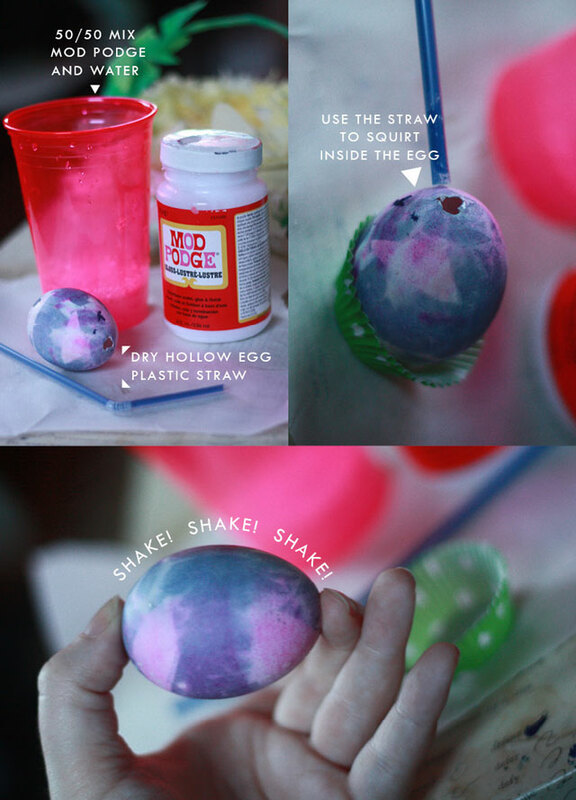 Insert watered down Mod Podge in the egg by any means necessary, shake it around, then let it fall out and dry. Whoop, there it is. Treat your eggs nice and they will last you, well, a long time. Long enough to survive a thrashing from Lola, anyhow. Never tried blowing hollow eggs before? Here is a great video. Never worked with Mod Podge before? Let Amy break it down for you. This is good stuff! Fantastic! Thanks for the tip! 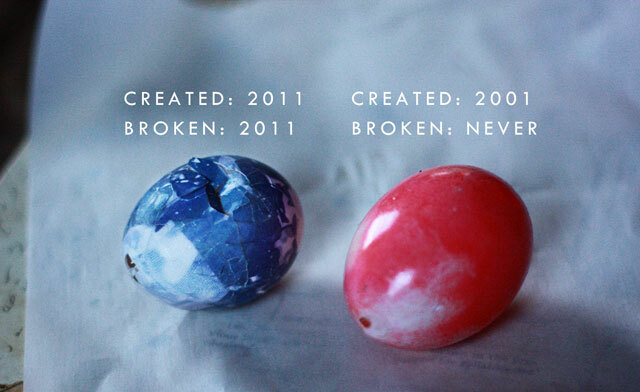 I have had so many broken eggs over the years. Really happy to maybe never have another one! Oh! These are amazing. Why didn’t you tell me about this hidden talent (egg blowing)? Are you gonna be nice and share some of your techniques for decorating eggs??? 🙂 I’m excited to try it! You are a genius! Did you ever make one of those Diorama large eggs. When I was little I always wanted one of those sugary eggs with a scene inside. I have some Martha boxes shaped liked eggs from way back when. Interested? I had no idea! From here on out, my eggs are sealed! Oh I so can NOT wait to do that…. Is the gold stuff paint or gold leaf? It’s so pretty and sparkely. 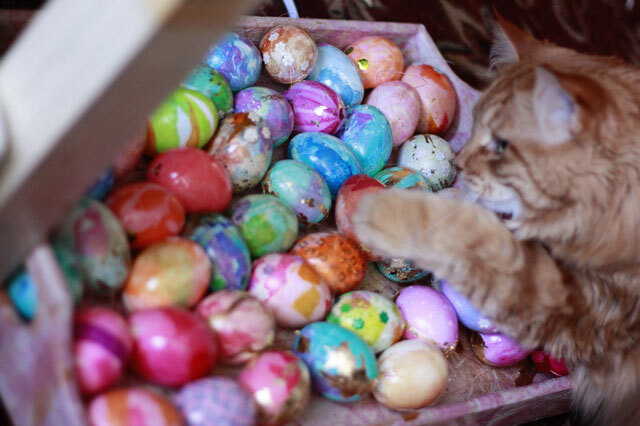 I would love to do a whole basket of golden eggs! Really helpful hint!! I’m really thinking about giving this a try.. I’ve never blown out an egg.. but it sounds like so much fun and this may just be the thing to push me over the edge if I can keep them for a bit! Yes!! Thank you i started an egg club at my school. Every one in the club is a fellow ‘eggster’ we make eggs take them to school and show… we started with boiling eggs but they rotted!!! Thanks for the idea i blew my eggs already and tonight im making the actual coating!!! Wish me luck!!! Yaay!! Thanks for the idea! I started a club atbmy school this week called the egg club!!! It really fun! We simply make eggs decorate them and bring them to school and like swing them and stuff.i am gonna do the coating after school today!!! Wish me luck!! Thanks for the tip. My son found a very unique football shaped egg in the current dozen I picked up and wants to save it. I’ll have to give this a try and see if it lasts for him. Can one, if doing a BUNCH of these eggs, just submerge them one by one in the Mod Podge solution, drain them and let dry? Use a bit of wire to suspend them while they dry? I am a lazy crafter. I have some blown out eggs waiting to be decorated and painted. Thought I would share this with you and your readers. If the straw method is to hard for some, try using a syringe with the needle removed to squirt the liquid into the egg. This works wonders for small openings. If you wonder where to find a syringe small enough for this purpose, check your local farm store or pet supply shop. If it is legal in your area for pet owners to inoculate animals, these stores will have the supplies. What happens to the inner membrane of the egg? Do we remove this prior to injecting the watered down modge podge? Either way. Most of the time the membranes have come out with the ‘innards’ but if it stays it’s fine – it’ll dry with the shell. Thank you. I have some hand painted eggs that have a great deal of sentimental value–I’m so excited to try this. I’ve tried to find an answer to my question with no luck. Perhaps someone here can help me? I need to cut a round hole approx the size of a quarter in the side of an egg. Any suggestions? Only suggestion I can think of is a drill bit with one of those round cup extensions — they make them extra fine grit for glass and pottery. That’s my best guess – good luck! 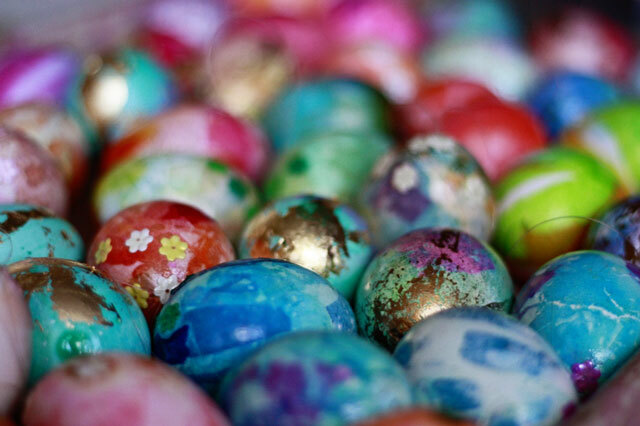 I have recently begun decorating eggs like these and I was just wondering if the Mod Podge mixture stays clear or if it will yellow over time or in sunlight. I am very excited to try this to keep my eggs from breaking, but I want to make sure they won’t yellow over time! Hi! What kind of paint can you use on them? Acrylic?